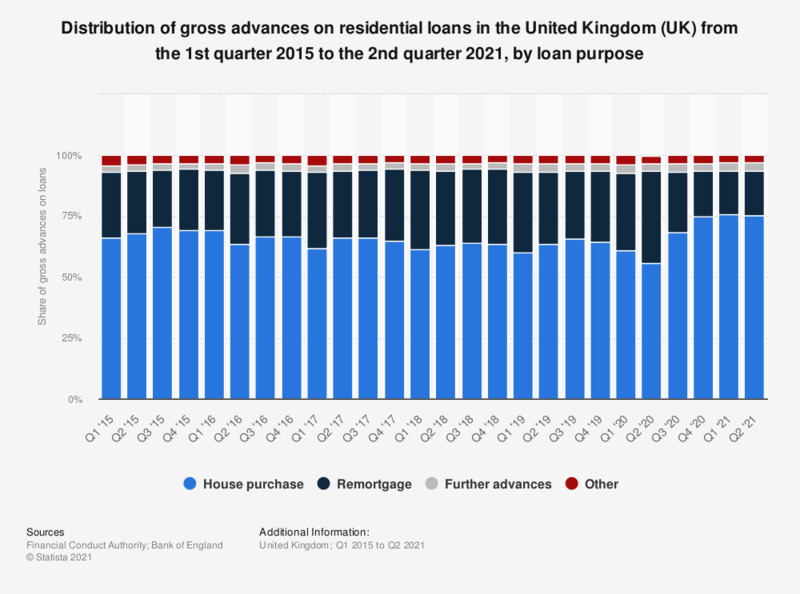 This statistic illustrates a breakdown of gross advances on residential loans for house purchase issued to individuals in the United Kingdom (UK) from the first quarter of 2015 to the second quarter of 2018, broken down by loan purpose. It can be seen that the share of gross advances for remortgaging fluctuated during this period, reaching a share of 30.8 percent as of the second quarter of 2018. This was an increase of approximately 3.5 percent in comparison to the first quarter of 2015. Furthermore, the share of gross advances for house purchase remained the largest during the period under observation, reaching a maximum of 70.4 percent in the third quarter of 2015.